I think Lama Govinda came to Tibet and met Domo Geshe Rinpoche, and maybe heard some teachings from him. That’s why he wrote The Way of the White Clouds and a second book, Foundations of Tibetan Mysticism, which is a mixture of tantra and science. 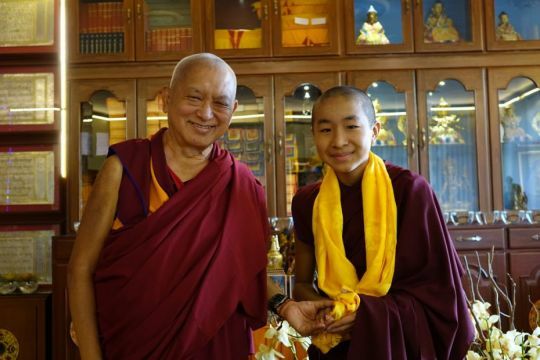 The Way of the White Clouds was one of the first books available in the West and our very first student, Zina Rachevsky, the Russian princess, read that book and came to look for a guru at Domo Geshe’s monastery in Ghoom, Darjeeling. Maybe she was looking for Domo Geshe. I was staying in a room in this monastery with my teacher who looked after me and my teacher Lama Yeshe. One monk met Zina outside. He could speak a few words of English so he brought her to my room, opened the door and said, “Oh, here’s your friend.” She was blond and had a Tibetan sweater from the Darjeeling bus station. My teacher offered Zina some Tibetan tea poured from a Tibetan kettle into a monk’s mug and that day she drank it completely. That was the only day I saw her drink Tibetan tea. From that time onwards I never saw her drink Tibetan tea again. It was by meeting Zina that we started Kopan monastery and built Lawudo at the same time. Gradually all the other centers happened and now there are 160 or maybe more, and we have forty-four geshes or maybe even more.